We believe in constant improvement of our equipment and systems so we have implemented the infrastructure to achieve this. Lankelma Technical Manager, Joseph Hobbs, and Instrumentation Engineer, Alastair Harman, spend 50% of their time working on new developments and improving on existing innovations. We initiate R&D projects ourselves in addition to working in collaboration with manufacturers, universities and consultants. With our own electro-technical and hydraulic workshops we can design and build innovative equipment for use on our projects. 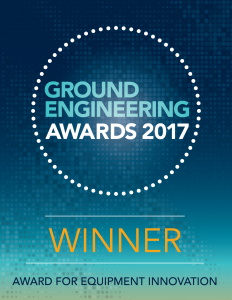 The growth in our R&D has resulted in acknowledgement from our industry over the years, culminating in winning the Ground Engineering Award for Equipment Innovation in 2017. To discuss a research and development opportunity, please contact us.